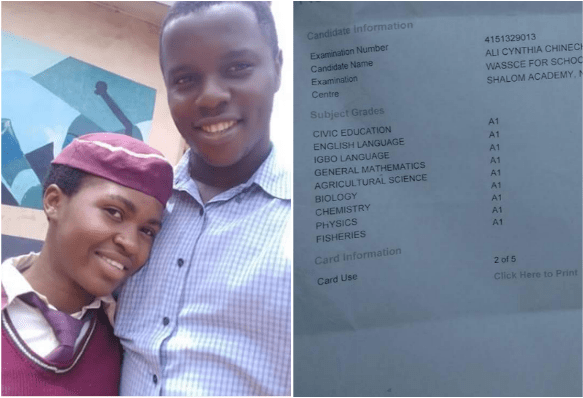 A WAEC candidate from Enugu state, Ali Cynthia Chineche, has made 9 A1s in all 9 subjects she sat for in the just released West African Senior School Certificate Examiniation, (WASSCE). Last year, a similar result was reported when a candidate from Kaduna state came out with A1 in all registered subject in the Exam. The results released by WAEC earlier in the week saw the Enugu student making an express A1 in all her nine subjects! Sharing the news, Cynthia’s teacher, Chibulu Austin wrote on Facebook, “Last year was someone from Kaduna state with nine A1’s. “Let the result talk for itself.